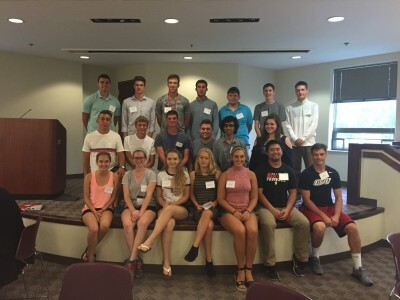 The Ohio Wesleyan Economics and Business Department and The Woltemade Center offer an exceptional program for incoming first-year students interested in economics, business administration, management (marketing and finance), accounting, or international business. The Economics Management Fellows Program (EMF) is intended for the best of the best. Only 15-20 students are accepted each year. Fellows are quickly introduced to all of the faculty and resources within the Economics Department, as well as to alumni and professional mentors. Fellows are also awarded a $250 bookstore gift card per semester for first three semesters (total of $750), assuming they have earned no less than a B in their Economics classes and maintain an overall GPA of no less than a 3.0. Fellows also enroll in a special seminar only for them, team-taught by the entire Economics and Business Department. The program provides a fully paid, faculty escorted study trip to New York City at the end of the spring semester. In addition to visiting the New York Federal Reserve and The New York Stock Exchange, seeing a baseball game and going to the theater, students meet with distinguished alumni and professionals in business and government. Internship and career opportunities are also presented across various fields. For details about the Economics Management Fellows Program, contact The Woltemade Center at 740-368-3550 or 740-368-3565.